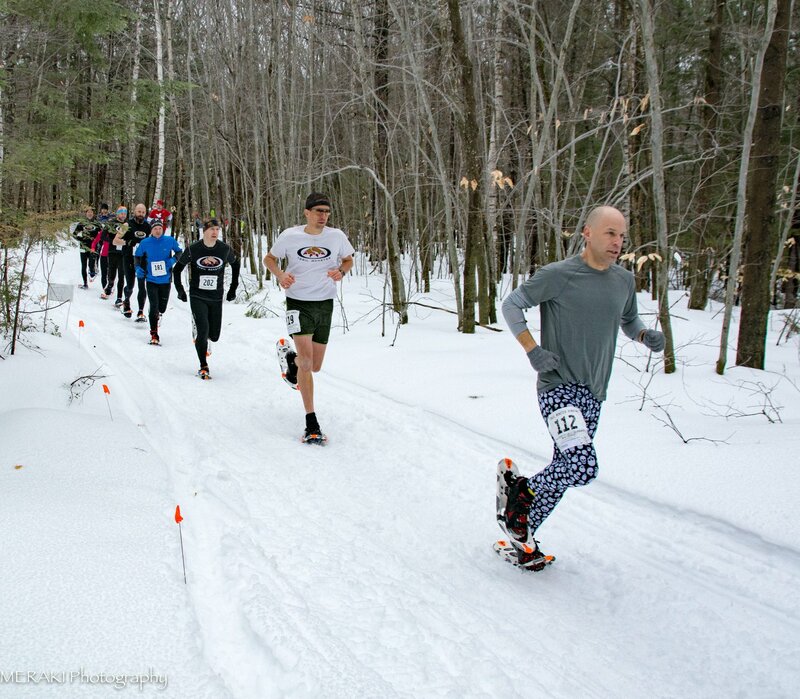 Today I ran my 2nd Bradbury snowshoe race for the 2018 season, which was my 2nd time completing the White Out (4 mile) race. Earlier this week, Maine got dumped on (again) with some fluffy white snow about midweek and then another smaller storm yesterday, which was making for perfect snowshoe conditions. But then another storm moved in and this time it brought rain. It rained a bit yesterday and the forecast was calling for rain during the race. But luckily it did NOT rain during the race. The weather gods nicely waited until the race was over until the rain started. a vinyasa flow and some pigeon. But the little rain we did get made the snow super slushy, which definitely created a super challenging (and very fun!) course today. Today I felt great. I felt ready to take on the trails at Bradbury. 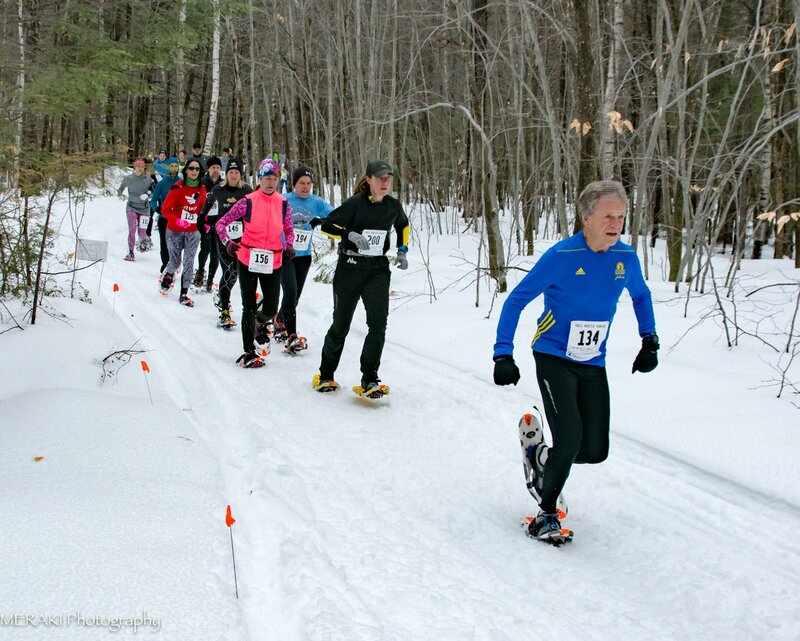 Which was so different than last Sunday's MidWinter Classic. Today just felt right. Ward and I got there early, which gave me plenty of time to visit the outhouse a few times and enough time to get in a warm up run. I finally tried my Altra Superiors out in some rather tough conditions - a sheet of ice covered by snow/slush. Walking was a challenge but when I went out for the warm up, the Superiors did NOT disappoint! 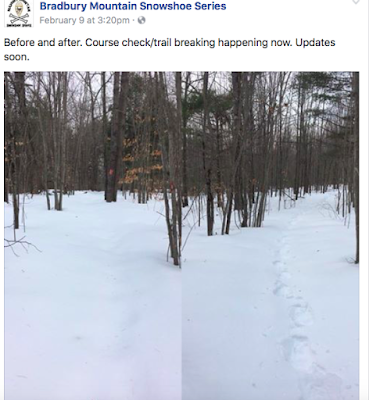 I felt super confident in their ability to take on the conditions we were faced with. I did head onto the road for a bit of the warm up and the Superiors were great there too. The versatility of the Superiors are definitely top notch. finally Ward listened to me and put on his badass Spandits! 16 miles yesterday, today 6th place overall. I came back to the car to grab my snowshoes and Ward and I headed over to the starting area. 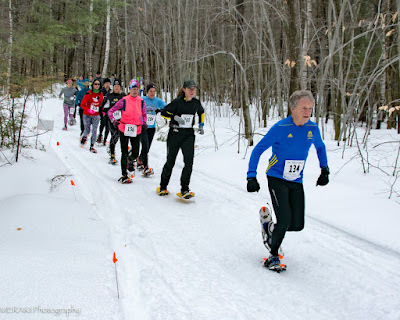 I took a few striders in the snowshoes to make sure they were on securely then found my spot in the lineup --- about middle of the pack. When the race started I went out hard, but not as hard, knowing I had an extra mile to do today and it was slushy as all get out! I wanted a good pace before we turned onto the single track. Today I did get myself stuck behind a woman. But I think I am finally figuring out the passing thing on snowshoes and when the opportunity presented itself, I took it. Passing could mean taking a step or two into some unknown territory and possibly lead to me pulling something... which wouldn't surprise me at all. But today, I didn't let myself stay stuck with the fear. Kinda a nice self victory for me. 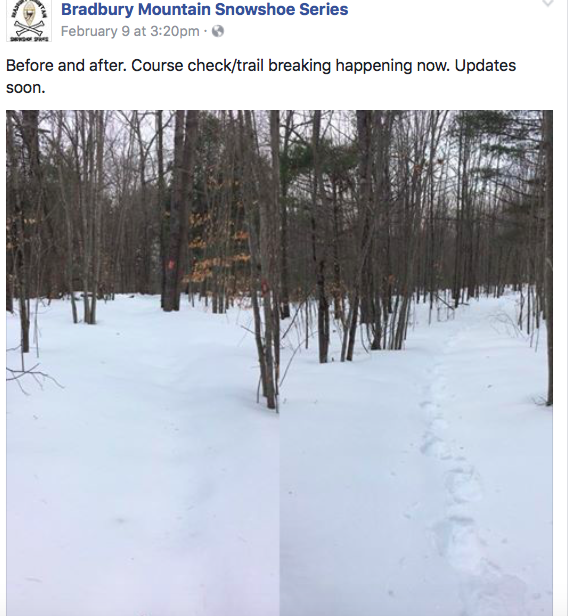 The single track was super narrow today and I kept hitting my ankles with the snowshoes.... over and over again. I definitely beat up my feet and ankles today, but that makes me more badass, right? After the race, a friend suggested metatarsal pads. I am definitely going to check that out. looks small here... but feels like it's huge! I have purple bruises on my feet. Fun times. When I saw Ward, I had those feelings of "UGH, why are you so darn fast" and "Oh yay! I'm almost there!!" again. I took off and worked on closing the gap even more with the woman in front of me. Which I did. I was hot on her trail. I didn't catch her... but I definitely closed that gap. The one thing that makes the Trail Monster Races way different than any other race is the the race director runs the course a day or two ahead of time (perhaps a few times) to break trail, check conditions, and to put out the flags and signs. Then he races it as well. 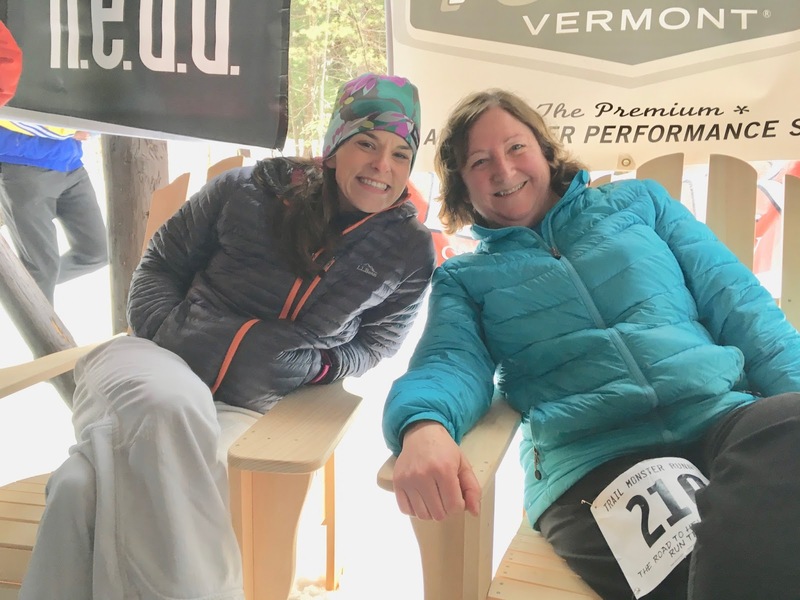 After all of this, he has a bunch of fabulous prizes from Baxter Beer, the Frontier, Lamey Wellehan and Adirondack chairs from Prospect Moutain Ski Chairs. After all of the overall winners and age group winners are done, Ryan draws some random numbers for prizes. Today I won big! I won a handmade Adirondack chair! Thank you, Bob! I love it! Jean drove down with friends and they didn't have room. Last year I placed 37 out of 88, with a time of 37:23. This year, 34th out of 84, with a time of 36:24. 59 seconds better than last year and in my opinion, tougher conditions. 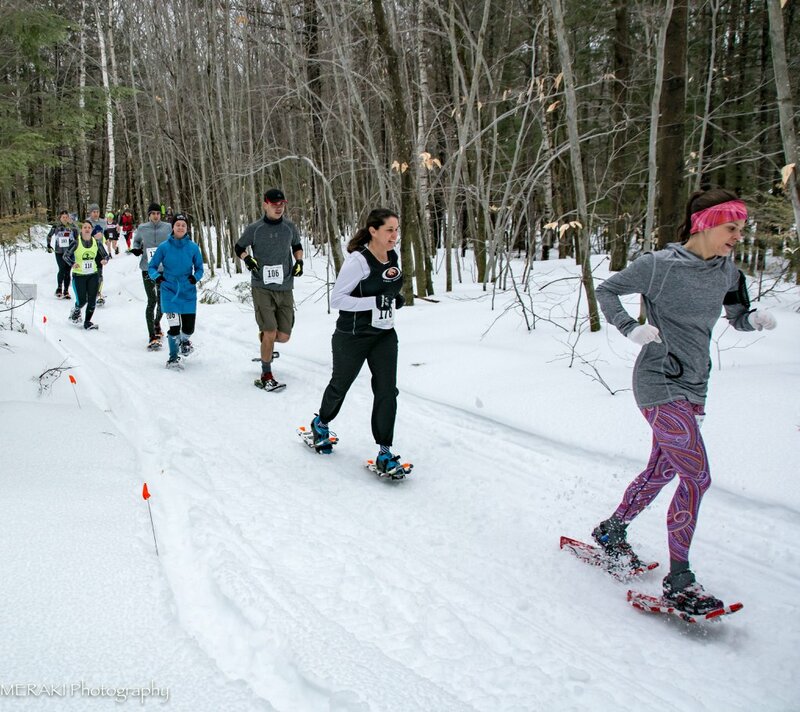 I'm seriously already looking forward to the 5 miler --- The Bradbury Blizzard, on March 4th. I cannot wait!